Warm congratulations on WoSign gaining Permit for Electronic Certification Services issued by the Ministry of Industry and Information Technology-WoSign SSL Certificates! 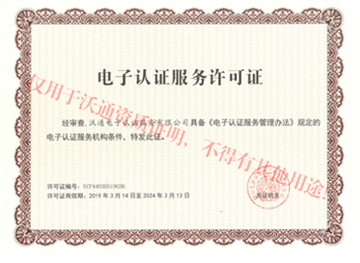 As the saying "Spend ten years in grinding a sword" goes, WoSign has been an agent for certificate products of foreign CA since 2004 and then started to develop our own product in 2006. In 2011, we issued certificates under our own top root certificate. Through years of hard work, we are very proud to be accredited by national authorities. At the same time, we know the duty to take it as our own responsibility to protect the security of domestic internet is summoning us. We are ready to meet new challenges. It is known that the central leading group on the network security and information was founded. General Secretary Xi Jinping points out that there is no secure nation without secure internet. Internet security protection has been elevated to the national strategic level. The most important fundamental technology of protecting internet security is PKI technology (Public Key Infrastructure technology). The cores of PKI technology system are electronic certification services and digital certificates, which can effectively ensure that online identity is authentic, online behavior traceable and information can be transmitted encrypted. Our country has already issued the Law of Electronic Signature ten years ago. The Ministry of Industry and Information Technology issued the "twelfth five-year" development plan of electronic certification services in November 2011. There are 34 CA who have acquired the permit from the Ministry of Industry and Information Technology. It is a pleasure for WoSign to become the 34th. WoSign appreciates much for the love and support from national authorities. This is the dream WoSign has had for ten years, which seemed to be unthinkable in the old days. The fact that a privately-owned company gained the permit of the highest national information technology department speaks volume for the national awareness of the importance of having domestic CA to take the responsibility of protecting national information system security. WoSign has done it in ten years' hard work. We will live up to all the expectations and meet new challenges. Domestic internet can be secure only by deploying domestic certificates. In this way, the security of all kinds of confidential information is ensured as well as the security of our country. WoSign is ready! We are ready! 1) Two top certificates, of which WoSign owns the intellectual property rights and proprietorship, have been issued by Microsoft in March 11 in Windows system and preset in global computers. The one and only Chinese root certificate in the world is the Root of Dragon customized exclusively for Chinese network users and ethnic Chinese users, which will help promote the popularization of PKI technology in our country and raise the security level of domestic internet environment. 2) The online application system for WoSign digital certificates is officially online on February 10. Users can choose different kinds of certificate products quickly and easily with discount. At the same time, WoSign introduced the marketing strategy of no charge for digital certificates of fundamental security level, including email encryption certificate and website encryption SSL certificate. This shows that WoSign has taken the responsibility of protecting the basic security of national information system and has received warm welcome from all the users. 3) The query system for certificate revocation list has been dilatated and upgraded on March 1, which can support five hundred millions searches per day. We are also ready to dilatate at any moment based on the needs. The response speed of this system, which is deployed in the national backbone network, is ten times faster than of foreign CA. It will greatly improve user experience of websites that have deployed SSL certificates. 4) We fully understand that there is much more needs to be done rather than deploying an SSL certificate to ensure website security. We also provide free value-added services of daily Trojan scan, vulnerability detection and safety protection for websites that have deployed WoSign SSL certificates.